Monday was a day of rather absurd good luck for me in WoW. I’m sure I’ve used up all my luck for months to come, and I’ll have nothing but bad drops and fail groups for the foreseeable future, but it was worth it. Prepare yourselves! The bells have tolled! As with every day at this time of year, I began my time in WoW by running the Headless Horseman holiday boss. I started with my warlock, planning to then do it again on all my other max level characters as is my tradition. After five years of grinding, I’d pretty much given up on ever getting it. Hell, there are people who’ve been playing since vanilla who still don’t have this thing. But there it was, cheerfully smiling up at me from within my bags. I love this mount. 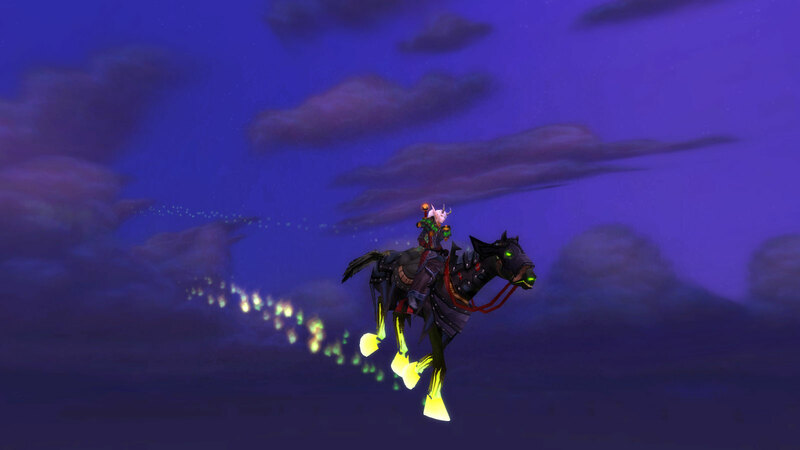 Partly because it’s an awesome mount — it’s a fel-fire wreathed horse that flies without wings — but also because it’s a reminder of how cool the Horseman is. It always amuses that a fairly silly pop culture reference of a holiday boss actually has a better and more lore-appropriate backstory than most “serious” bosses. Now scatter, scurry, shriek in pain! No mercy this night abides! On Hallow’s End, when the Horseman rides! But that was just the beginning of my good fortune. 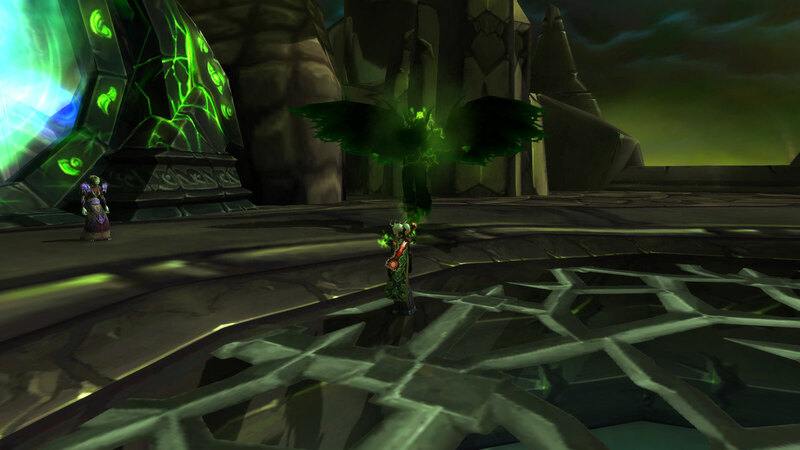 Earlier that day, I heard some random commenter on WoW Insider mention that the final boss of the warlock green fire quest had been inadvertently made much easier by the 6.0 patch, so I decided to give it one final try, having failed repeatedly whenever I’d tried in the past. Sure enough, old Kanrethad was a lot weaker than before. The main difference is that his health seems much lower, even taking into account the effects of the item squish. It was still a bit tricky, and it took me several tries, but in the end, I managed to burn him down. I’m actually not that fond of green fire, so I’ll probably turn it off before too long, but it was nice to get it done. Surprisingly, the feat of strength and its associated “____ of the Black Harvest” title are still available. Most thought they would be removed after 6.0, but it turns out they’re still valid until Warlords of Draenor launches. Getting the title is what makes me really happy. It just sounds cool, and considering it’s only going to be available for a few more weeks, that’s some good timing on my part. Sure, I probably don’t deserve it since the fight is now clearly much easier than was intended, but… screw it, I don’t care. To cap off the day, I hopped on my rogue and tried out the new premade group finder in the hopes of taking advantage of the guaranteed heirloom off Garrosh until WoD. After being rejected by about a dozen groups, I found a heroic (formerly normal) group willing to take me that was already on Garrosh. We wiped a few times, but in the end, we managed to get him down with minimal trouble and only a little dickishness and douchebaggery on the part of my fellow raiders. I got myself my heirloom dagger — a major improvement over the heroic scenario drop I was using before — and a warforged belt. 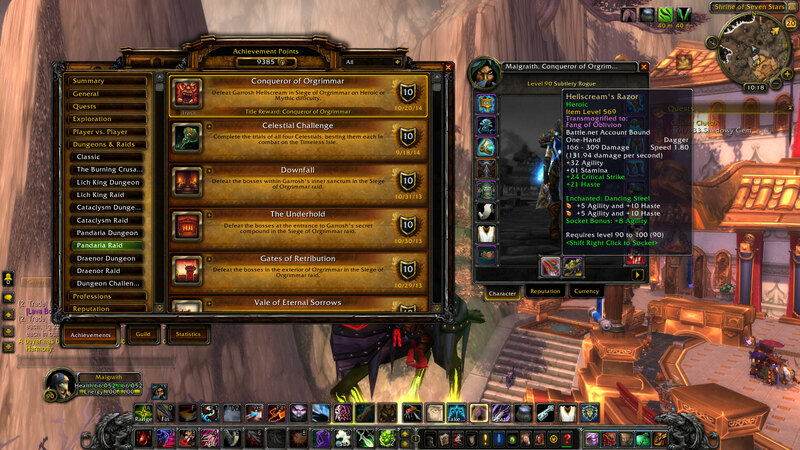 This also earns me the “Conqueror of Orgrimmar” title… although I still think “Hordebreaker” has a better ring to it. My latest article for ADANAI is Top 10 Unconventional Video Game Heroes. Covering those who do not fit into the stereotypical mould of beefy, gun-toting white guys. This was a strange article to research. 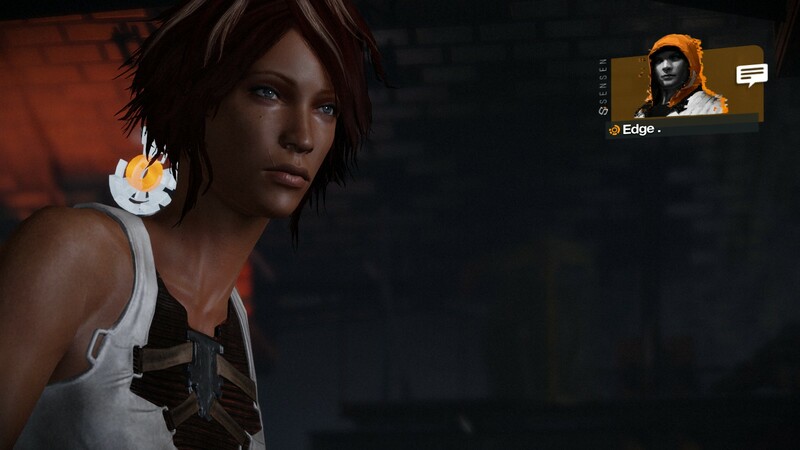 It’s actually easier to find good female video game heroes than I would have expected. Obviously, they’re still a minority, but it’s not as vanishingly small as you might think. I also found that the majority of non-white video game heroes are of mixed race, usually with one white parent. I’m unclear on whether this speaks to a desire to be progressive by refusing to conform to rigid racial structures, or an attempt to “soften the blow” by giving them all a twist of whiteness. Most non-white heroes also seem to be female. The most underrepresented group seems to be LGBT characters — not surprising considering the virulent homophobia that dominates the gaming community. What really surprised me is how incredibly hard it is to find unconventional male heroes. If you want to play a game where the hero is male, but not a steroid-abusing white guy, your options are shockingly slim. Non-white men and men who aren’t mountainous brutes seem to be almost unheard of. Since I don’t find anything identifiable about muscular man-bulls, it is perhaps not surprising that I tend to play female characters so much. I mean, the vast majority of people playing games are probably wimpy little geeks like me. Why can’t we have some heroes who are more brainy than brawny? This entry was posted in Games, My writing and tagged fantasy, video games, Warcraft, World of Warcraft, writing by Tyler F.M. Edwards. Bookmark the permalink. Congratulations on the mount. I got mine back in the WotLK days.